This is a unique garden grow laboratory that allows you to experience the wonders of seeding a plant and watching it grow from a seed to maturity. No matter your age you will love the Root vue. 8 special biopower grow mix wafers, 3 packs of seeds, identification labels and 16 page booklet with instructions and experiments. For ages 4 & up. 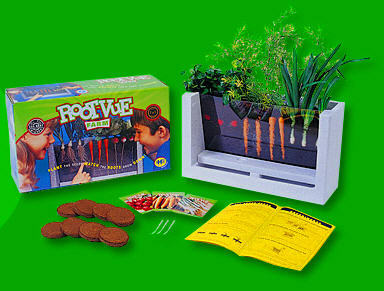 We are sure you will be impressed with the root-vue garden laboratory.